Dear readers, we have recently covered some of the non-pakistani-imams that were rushed through Jamia and even though they failed, were made imam’s by the Ahmadi Khalifa. 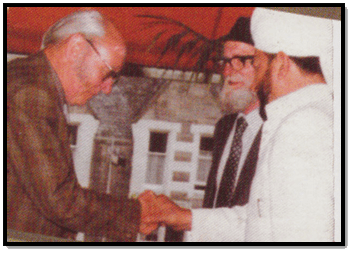 Bashir Ahmad Orchard, previously known as John Bren Orchard (April 26th, 1920 – July 8th, 2002), seems to be their first ever indigenous European Ahmadiyya Missionary, he was born in Torquay, England and thus became the first ever English-Ahmadi-missionary. His brother was a Roman Catholic priest. But to the astonishment of his fellow officers, he began to take instruction in Ahmadiyya. For Bashir Orchard, after the war, there were no prospects, things were bad and rationing of the basic food, Britain was devastated by the german bombing and overall war effort, there was rubble everywhere, things were not looking good for him. Joining Ahmadiyya was a good situation, where he got a super-young desi- woman, employment and comfy life. He was sent off as a missionary by the 2nd Khalifa, however, he didn’t pass Jamia or any other islamic school, the Khalifa waived all of that and made Bashir Ahmad Orchard a Murrabi nevertheless. He was given an important young Ahmadi woman, in fact, Orchard became a brother-in-law of the Khalifa since he married the only sibling of the Khalifa’s first wife. His preaching was very unsuccessful, his son even admitted as much, both in Scotland and Guyana. He seems to have been specifically used as the token English-Ahmadi and was marketed as such. He also claimed to be a recipient of divine revelations and true dreams. When he died in 2002, the ROR wrote the story of his life and conversion. Bashir Ahmad Orchard interviewed. His children interviewed. He was married to Qanita in 1948 in either Lahore or Rabwah, she died in 2011, Ahmadiyya sources claim that she was 81 at death, which makes her DOB as roughly 1930. She was the granddaughter of Dr. Khalifa Rasheed-ud-din and was the niece of Umme Nasir, first wife of Khalifatul Masih II. They had 5 children in total. 2 daughters and 3 sons. This is interesting, since Dr. Khalifa Rasheed-ud-din only had 2 daughters, one was married off to Mirza Basheer-ud-did Mahmud Ahmad and the other daughter was married to a Shia-Muslim. Bashir Ahmad Orchard seems to have married into that tree. Nasira Rehman is a daughter of his. Abida Rehman is another. The son of Bashir Ahmad Orchard did an interview a few years ago, his son’s name is Nisar Ahmad Orchard. He has another son named Nasir Orchard. Essah Orchard is also interviewed, he is a grandson of Bashir Ahmad Orchard. He fought in WW-2 in France, was evacuated from Dunkirk, and was commissioned as an officer for British-India as he fought on the Burma front. By age 24, he was a drunkard, heavy gambler and heavy smoker. He most likely indulged in prostitutes like most British officers as well. In 1945 through Sergeant Abdul Rehman Sahib Dehlvi he was introduced to Ahmadiyya. Orchard tells us that he visited Qadian during the final stages of the official Burma campaign. By April, the Japanese had been totally beaten in Burma, a few months later, atom bombs were dropped. During his trip to Qadian, he met the Khalifa and saw Qadian in full detail. He then returned to his unit and defeated the Japanese and returned to England on April 21st, 1946. While in England, he visits the famous Ahmadiyya Fazl Mosque, and meets Jalal ud Din Shams and inquires what it would take to become an Ahmadi murrabi. He is then accepted by the Khalifa and prepares to spend the rest of his life as an Ahmadi missionary. Orchard arrives in Qadian and is greeted by the Khalifa and given a warm reception. He was given an ahmadi woman and was married. Orchard claims to have remained in Qadian until the partition, he then recalls a story wherein he was part of a major convoy from Qadian to Lahore. He claims that his future wife was also in this convoy, she was in one of the trucks and he was in another (see 23:32 mark). Although he couldn’t remember, he seems to have spent time in Lahore and Rabwah up until 1949, wherein he was sent to Glasgow, Scotland by the Khalifa. He is married into a major Ahmadi family, he is now a brother-in-law with the Khalifa. He seems to have been stationed at Glasgow, Scotland by the Khalifa. His wife went with him. The Khalifa orders Orchard to go the west Indies and preach Ahmadiyya, his young wife went with him. He went to Guyana to be specific. The Ahmadiyya Jamaat doesn’t seem to have grown much in this area and in these 14 years. Nor has it grown much after. He returned to Glasgow, Scotland. Even though he was a paid-employee of the Mirza family, he was allowed to sell stamps and thus make money for his own welfare as well as other random expenses. His wife and kids lived in the mission house in Glasgow. Thus, Ahmadiyya INC saved money. He moved to South England and continued working as a missionary, first in Oxford and later to London. He is on the editorial board of the Review of Religions, see the May 1984 edition. He remained as its editor until at least December of 1990. He doesn’t seem to be very good at giving speeches or leading prayers, the Ahmadiyya jamaat thus uses Orchard in an area wherein he might be of service, editing the english language. Most of his writings are general in nature, he doesn’t have the capacity or knowledge to write about in-depth islamic topics. Its unclear if he edited the Moslem Sunrise, it doesn’t seem so, however, he did have some of his essays published in it. We have written about this mullah before. As soon as he died, Ahmadiyya INC seems to have hired Noonan as a replacement. In the below, we have posted his conversion story. Bashir Ahmad Orchard was the first ever Irish-born Ahmadiyya-mullah. He seems to have converted to Ahmadiyya in the mid-1940’s. He seems to have had a video camera and has shared footage of Qadian in 1947. 1. Muhammad Zafrullah Khan seems to have the biggest house in Qadian by 1947. 2. Qadian seems to be simply a 3-mile radius of ‘village-homes”, with a few larger homes, which seem to only include MGA’s home and Zafrullah Khan’s home. 3. In 1947, Qadian was the only place in the Punjab wherein Muslims were left un-molested as the mass migration shook the entire sub-continent. Smith reports that Mahmud Ahmad and the majority of the population at Qadian remained present in Qadian, until the British govts. military showed up and forced them to leave. Smith reports that Mahmud Ahmad was safely transported out of Qadian under military protection. We have found an old edition of the ROR-english from June of 1947. This mostly relates to the conversion of Bashir Ahmad Orchard to Ahmadiyya. This proves that he only joined Ahmadiyya based on the respect that was shown to him. Who is Dr. Khalifa Rasheed-ud-din? His daughter was married to the son of MGA. Mirza Basheer-ud-Din Mahmud Ahmad had 9+ children with the daughter of Dr. Khalifa Rasheed-ud-Din. Incidentally, his other daughter was married to a non-Ahmadi Muslim in Qadian and on the same day (in 1902). Nevertheless, this other daughters children seem to have been eventually married into Ahmadi’s. One of her daughters was married off to Bashir Ahmad Orchard, the first English-Ahmadi-imam. They had 5 children, 3 boys and 2 girls. We are not sure about her other children and where they went. He was a MBBS physician. He is mentioned as part of the first 313 Ahmadi’s list. His daughter is married to the son of MGA, Mirza Basheer-ud-Din Mahmud Ahmad, she is barely 10 years old. He is made a member of the Sadr Anjuman. He wrote an article on 24 May 1908, two days before the death of Mirza Ghulam Ahmad, which was published in the Ahmadiyya newspaper Badr shortly after Hazrat Mirza’s death in its issue dated 11 June 1908 on the front page and page 2. Go here to view scanned images of the entire article from Badr. As far as I can see, each of these totals as it was at the end of March 1914, when Maulana Muhammad Ali was in Qadian, is exactly the same as the corresponding “carried forward” total at the end of April, by which time Maulana Muhammad Ali had left Qadian and these funds were in the hands of the Qadiani Jamaat! This, if I am right, is absolute and positive proof, coming from a Qadiani Jamaat publication, that all the funds of the Sadr Anjuman Ahmadiyya remained with the Qadiani Jamaat after Maulana Muhammad Ali left Qadian, and he took nothing. It is said, from Lahori-Ahmadi’s that I know, that he eventually left the Qadiani Jamaat and moved to Lahore and re-started his medical practice. He did not turn against QK2, as his daughter was married to him, but became inactive in Qadiani Jamaat. He did not join Lahore Ahmadiyya Movement. Who is Dr. Mirza Munawar Ahmad? Mirza Munawar Ahmad (1918–1990) was the 3rd eldest child of Mirza Basheer-uddin Mahmud Ahmad. He was the first grandchild of MGA to become a qualified doctor. Bashir Ahmad Orchard, the first ever Irish-Ahmadi-imam seems to have written his life story in the Review of Religions of December–1990 (see pages 39-40). He married his first cousin, Mahmooda Begum, daughter of Nawab Muhammad Ali in 1940. “”””The Ahmadiyya Movement in Islam mourns the death of one of its illustrious sons, Dr Munawwar Ahmad, who passed away in Rabwah, Pakistan on the 19th September, 1990, at the age of seventy-two. He was the grandson of Hazrat Mirza Ghulam Ahmad, the Promised Messiah and Holy Founder of the Ahmadiyya Movement. He was also the third son of Hazrat Mirza Bashir-ud-Din Mahmood Ahmad, second successor of the Promised messiah, and his spouse Umme Nasir. Dr Munawwar Ahmad was born in Qadian, India, on the 1st of February, 1918. In 1940 he married Mahmooda Begum, daughter of Nawab Muhammad Ali. He studied medicine at the King Edward Medical College, Lahore and had the distinction of being the first doctor in the family of the Promised Messiah. After graduation he was medical demonstrator at Glansay Medical College, Amritsar, and from 1945-1947 he worked at the Nur Hospital, Qadian. Later, after the partition of the Indian sub-continent, he played a large part in building the Fazl-e-Omer Hospital in Rabwah, Pakistan, and was its chief medical officer from 1955-1983. Now the post is held by his son, Dr. Mubashar Ahmad. Dr Munawwar Ahmad was particularly concerned for the medical care of the poor and he organised a system for providing them with free treatment and medicine at the hospital. He always prayed for his patients and considered that trusting in medicine alone was tantamount to the setting up of an equal with God. He was the personal physician to both the second and third successors of the Promised Messiah, Hazrat Mirza Bashir-ud-Din Mahmood Ahmad and Hazrat Mirza Nasir Ahmad respectively. In 1955 He accompanied Hazrat Mirza Bashir-ud-Din Mahmood Ahmad to Europe where he went for treatment following a dastardly attack on his life when he received a deep and dangerous stab wound in the neck. As I have mentioned he was a very prayerful person and was regular in attending congregational prayers in the mosque. He did not allow climatic and weather conditions to prevent him from going to the mosque. He would offer long prayers with full and earnest attention. He was also very loyal, respectful and obedient to the Khalifa of the time. In addition to his medical duties which required much of his time and attention, he was also engaged in other activities of the Community. He was the Vice-President of the Central Khuddamul Ahmadiyya Association which attended to the spiritual and all round training of the male members of the Community between the ages of fifteen and forty. He held this office from 1950-1956. Later he became the Vice-President of the Central Ansarullah Association which attends to similar needs for male members over the age of forty. He also served on various other committees. I first had the pleasure of meeting him in one of the narrow thoroughfares of Qadian during one of my early visits to that holy place either in 1945 or 1946. At that time I was unaware who he was nor do I remember what words may have passed between us. What I do remember, however, was the bright and smiling countenance with which he greeted me and which was always a permanent feature in his appearance. The last time I met him was at his home in Rabwah, Pakistan, when my wife and I paid him a surprise visit during our short ten day stay there in 1989. He welcomed us in a most gracious, cheerful and amiable manner. He was suffering from several ailments which he nobly concealed under cover of his pleasant and happy demeanour. Diagnosis by Mirza Munawar Ahmad (son of Mahmud Ahmad).